This attractive house is located within the vicinity of many mid-19th century houses and structures of historical importance, and thus contributes to the continuity of the street and community. 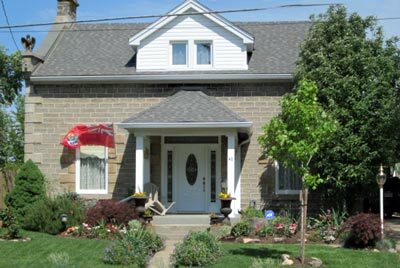 There is little doubt that the reason this house (and its neighbour) maintained their original locations, in spite of the expropriation of land (1913) for the expansion of the 4th Welland Canal, was due to their stone construction. They stand, uniquely poised, as witnesses to the changing landscape of Thorold as it was shaped by commercial and industrial expansion in the early 20th century. James Stewart was born in Scotland, learned the stonecutter’s trade early in life and did contracting on the old Welland Canal when built, and elsewhere. By 1868 records show him, his wife and family in the house on Chapel Street. The architect and builder of the house are probably the same; given their professions as stone cutter and mason, it seems probable that owners of lots 26 and 27, James Stewart and his brother-in-law David Robertson were involved with procuring and laying the stone for their houses. These two stone houses are only among the few to be found in the Canal areas of Thorold; they bear a strong affinity to the Tracy House.